Toshiba C850-1C0 Cheapest Business Laptop Intel Dual Core 4GB 640GB HDMI Win 8. Warranty: Condition : Toshiba Reconditioned to Like New Standards. 1 Year Warranty. First 3 Months Free Collect & Return Direct with Toshiba followed by 9 Months Return To Base / Store Warranty with Laptop Outlet. The Satellite C850 series offers great value and great quality for everyday computing and features a 39.6cm (15.6") display and textured matt black finish. Extensive connectivity options are incorporated and include SuperSpeed USB 3.0, HDMI and an integrated numeric keypad for added convenience and ease of use. The Satellite C850 features a new streamlined design in a textured matt black finish that weighs only 2.30 kg, and yet contains all the power and functionality you need. The textured finish gives it a smart look and feel on the outside, and underneath you'll find a reliable Intel processor, spacious storage and fast memory to give you performance worthy of this professional design. A 39.6cm (15.6") display makes the Toshiba Satellite C850 an ideal desktop replacement and, with LED backlighting, it always delivers sharp and vivid images. These images are driven by an efficient Intel dual-core processor, along with fast RAM and a spacious hard drive - perfect for storing all your favourite movies and music. 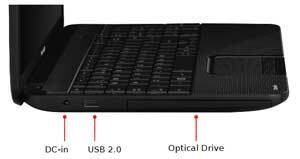 The Toshiba Satellite C850 comes with a spacious full size keyboard with numeric keypad. This is ideal for applications such as spreadsheets, and will ensure that typing on the C850 is always a comfortable experience, wherever you are. SRS Premium Sound HD helps you to get the best sound experience possible from your music, movies and games. 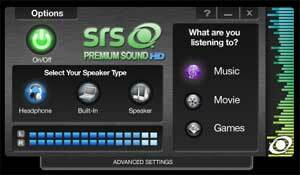 SRS Premium Sound HD delivers the most complete audio entertainment experience possible for all PC applications related to music, movies and games. SRS Premium Sound HD utilises advanced patented techniques to retrieve audio cues buried in the original source material, as well as deliver immersive surround complete with deep, rich bass and crystal clear dialogue. Additionally, Premium Sound HD ensures users a premium and natural entertainment experience whether you are using the laptop speakers or headphones. SRS Premium Sound HD features an intuitive user-friendly interface which offers users the ability to personalise their listening experience using multiple presets for music, movies and games. The Satellite C850 has a number of connectivity options available, including HDMI and USB 3.0. Experience the transfer rates of the future with USB 3.0. By connecting to a compatible USB 3.0 device, such as an external drive, SuperSpeed USB 3.0 can offer up to 10 times faster transfer rates than today's Hi-Speed USB 2.0 standard. This means that files and folders that took hours to transfer now just take minutes, and you can move whole albums to and from your laptop in just a few seconds, saving you time and making your media much more portable. Just imagine - now you can move a feature-length movie to a portable drive in just a few minutes, ready to take to a friend's house and watch on the big screen. 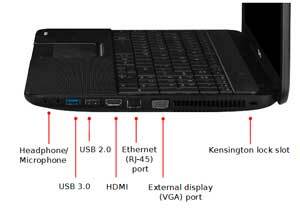 See some of the features of the Toshiba Satellite C850 laptop. 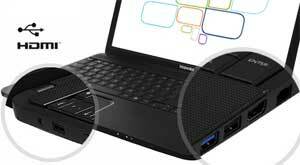 The Toshiba Satellite C850 has an integrated HDMI port for added convenience and enhanced usability. Now you can connect your laptop to an external device and stream high definition content. When using HDMI, audio and visual content are streamed through a single cable, removing the need for multiple connections. Now you only need one cable, making connecting your laptop easier and tidier. The Satellite C850 features an integrated 1.0 MP web camera with Toshiba Face Recognition. The camera and microphone let you see and hear your contacts online, and can take still pictures, video clips and audio notes. With Toshiba's integrated WebCam communication is made easy--network with friends and family from the comfort of your own home. Using numerous passwords can complicate things, so instead of worrying about remembering all of these, or using a single password that can be compromised, the Satellite C850 features Toshiba Face Recognition--the fun and easy way to log on to your laptop. Toshiba Face Recognition is a biometric-based identification method and uses the web camto automatically detect 14 separate facial feature points to verify your identity and grant you fast and simple access to your data. Once your facial profile has been saved it can be used to access the system. Additional users can store their own unique facial recognition profile, allowing your whole family to use the computer conveniently. 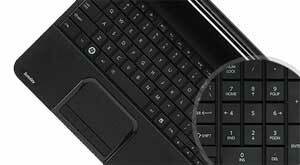 The full-sized keyboard and numeric keypad help to make typing a comfortable experience. The Satellite C850's touchpad features multi-touch gesture support, providing an innovative alternative to conventional scrolling and buttons. The touchpad features an advanced, touch-sensitive interface solution that senses the position of a finger or fingers on its surface and recognises pinching, swiping, and rotating motions performed by simply moving your fingers. Pinch Gesture--two-finger pinch delivers zooming functionality in many Windows applications. The two-finger pinch zoom can be used to zoom in or out of photos, maps, or documents. One or Two Finger Scrolling--scrolling delivers functionality in Windows applications by using one or two separate fingers in a horizontal or vertical motion anywhere on the touchpad, with the scrolling rate controlled by your finger speed. Chiral Scrolling--whenever you wish to scroll just slide two fingers downwards (or upwards) and then you can move your fingers in clockwise or anticlockwise motion to continue scrolling. Momentum Motion--delivers smooth, fast, trackball-like cursor motion. A quick flick of one finger across the touchpad surface can move the cursor across the entire screen and is ideal for use with computer gaming applications. Rotation--rotate photos and other items in 90-degree increments by placing two separated fingers on the touchpad and moving them around in a continuous clockwise or counter-clockwise circular motion. Take control with the multi-touch gesture touchpad. Youll get everything you need to get moving straight away. McAfee Internet Security free trial instantly detects and blocks viruses, including stopping web threats before they are downloaded to your PC. Skype is also included for face to face video calls and phone calls to both other Skype users and ordinary phones. Condition : Toshiba Reconditioned to Like New Standards. 1 Year Warranty. First 3 Months Free Collect & Return Direct with Toshiba followed by 9 Months Return To Base / Store Warranty with Laptop Outlet.